Science AMA Series: Hi Reddit! We're scientists aboard NOAA Ship Okeanos Explorer on a mission to explore deep, unseen waters in the southeast U.S. continental margin. Ask Us Anything! 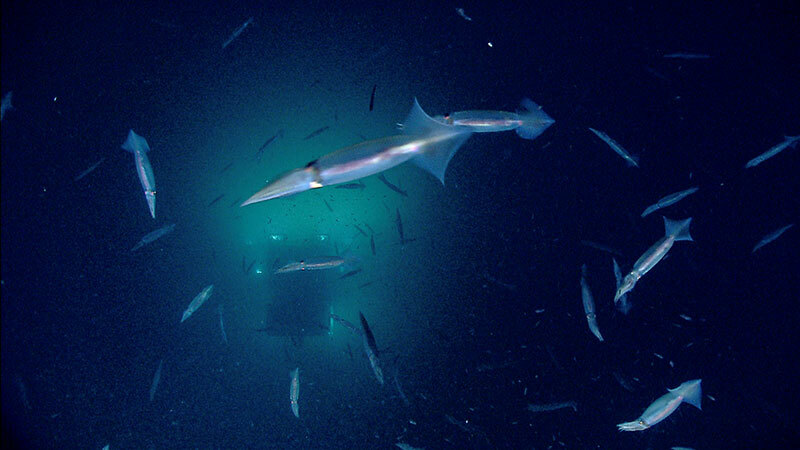 Camera sled Seirios encounters a school of squid while ROV Deep Discoverer investigates Washington Canyon. Image courtesy of the NOAA Office of Ocean Exploration and Research, Our Deepwater Backyard: Exploring Atlantic Canyons and Seamounts. Meet Derek Sowers (NOAA seafloor mapping expert), Kasey Cantwell (NOAA ocean explorer), Cheryl Morrison (research geneticist, U.S. Geological Survey), and Leslie Sautter (geologist, College of Charleston). On June 14, they will be joined by the Mission Team on board NOAA Ship Okeanos Explorer to answer your questions about the Windows to the Deep 2018: Exploration of the Southeast U.S. Continental Margin expedition. Throughout the expedition, they are using remotely operated vehicles (ROVs) to explore the seafloor and video streams from the ROVs are being transmitted via satellite from ship to shore. This means anyone with an Internet connection – including YOU! – can tune in LIVE with scientists from around the world, sharing an unprecedented glimpse of never-seen-before deep marine habitats. They expect to encounter large, diverse coral and sponge communities; uncover important deep-sea ecosystems; explore historical shipwrecks; map the seafloor; and learn more about the geologic history of the area. Information collected during the expedition will expand our knowledge of these unknown and poorly known deepwater areas and to provide data for decision makers. Derek, Kasey, Cheryl, and Leslie have all participated in numerous deep-ocean exploration missions and on June 14, they will be on Reddit from 2:00 pm ET to 4:00 pm ET to answer your questions about the current expedition or ocean exploration in general...Ask Them Anything!